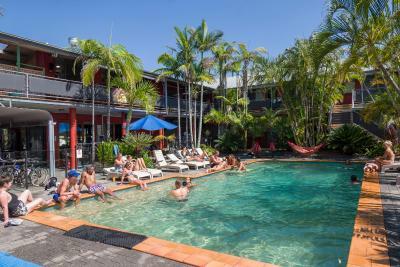 Lock in a great price for Cape Byron Hostel YHA – rated 8.4 by recent guests! The coffee place next door is really good - but has nothing to do with the hostel itself. I booked a 10 beds dorm since I only stay for one night but got upgraded to a 5 beds dorm and I only share the room with one guy. The facility is clean enough for a hostel standard. However, the staff is so helpful and friendly. The hostel is huge with many rooms. There are lockers in the room but you have to provide your own lock. The room is quite soundproof and away from the common area so you are not extremely disturbed by the noise. There is a common area, a kitchen and separate toilets and showers for men and women. I did enjoy the fact that the hostel is only 5’ walk to the beach and also about 5’ walk to Johnson street which is the Main Street where you can find all the restaurants and shops and supermarkets. For those who took greyhound to Byron Bay, it’s a 7-10’ walk from the bus station to this hostel. Very convenient. The activities offered such as walks, visit to the market, the get together etc. Great location, kitchen space and activities organised by the hostel! Great location, good facilities & friendly, helpful staff. Cosy hostel, close to the beach and everything - good location. Friendly personnel. They got new surf boards when I was there! And quite ok price for the surf board rental. Staff were super friendly and helpful! A lovely lady Named Liv saved my but! I owe her a huge thanks! Very clean, nice commom area and pool, very nice and accomodating staff. Stayed in a 10 bed-bedroom, but felt more like a 5 bed as there are a deviding wall and two doors. Good location, close to beach and cafes. Cape Byron Hostel YHA This rating is a reflection of how the property compares to the industry standard when it comes to price, facilities and services available. It's based on a self-evaluation by the property. Use this rating to help choose your stay! 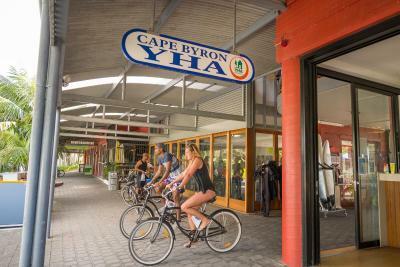 Cape Byron Hostel YHA is located in the center of Byron Bay and is only 650 feet from Main Beach. 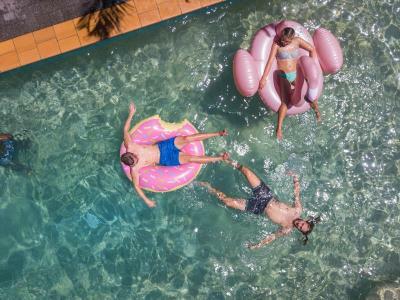 You can relax in the common areas surrounding a large heated pool and BBQ area. Come and enjoy the free use of boogie boards or hire a surfboard or bike. Cape Byron YHA Hostel is 1.9 mi from Cape Byron Lighthouse and it is 20 minutes’ drive to Crystal Castle. 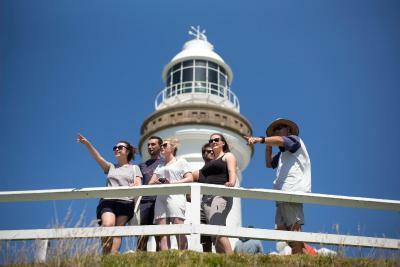 Free walking tours to the lighthouse and other weekly activities are available. 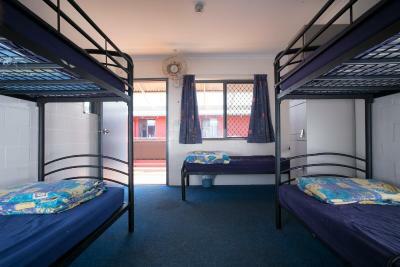 Private and dormitory rooms are available. All rooms have access to shared bathroom facilities. Facilities include a cafe, dove center and separate TV/reading room. 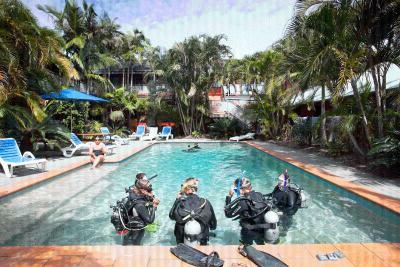 The tour desk can arrange sea kayaking, surfing lessons, hang-gliding, horse riding and trips to Nimbin. Limited, free parking is available. 뀐 Located in the top-rated area in Byron Bay, this property has an excellent location score of 9.3! When would you like to stay at Cape Byron Hostel YHA? This room includes a shared bathroom, shared toilet and a common entertainment area. Private room with access to shared bathroom facilities. Rooms are 90 square yards. House Rules Cape Byron Hostel YHA takes special requests – add in the next step! Cape Byron Hostel YHA accepts these cards and reserves the right to temporarily hold an amount prior to arrival. Guests under the age of 18 years are not permitted to stay in the dormitory rooms. Please note that you cannot check in or check out on Christmas Day (25 December). The lack of aircon in the room was unbearable when we had a full room. The fans just don’t do the job. Mattress was not comfortable, too old and worn out, need new ones! Warm in the rooms, no air condition, only fans. Old and used pots and pans in the kitchen, need an upgrade/new ones! Wifi wasn't the best. Gets a bit grubby at times but hard to constantly keep clean with so many people there cooking, etc. Great location and good facilities. The rooms were very hot cause there was only a fan. It also is a very quiet hostel not very good for parties that’s why not a lot of young people stay there. The pool was great and it was very clean. Staff was super friendly, too! My wallet fell out of my pocket in the communal area. It was handed back to the reception staff and they looked after it. I was most grateful. I appreciated the after 11pm quiet time in the communal area. Most people respected this. Too hot in the rooms, no air con only a fan. No aircondition, impossible to sleep in the warm weather.